Material - Solid Brass & High Polished. Top - Made of High and Top Plating. Price - 100% Factory Direct & Lowest price. If not reported, we will not issue credit. Gold Plated Material. Lead & Nickle Free. § Earring Weight:<0.1 Grams (Pair). § 1 Pair: 2 Side Pair(Left & Right). § Material: Stainless Steel. § Butterfly Back Closure. § Smooth Polish (Actual Color in Photos). The Earring is iced out in LAB simulated White,Round, Cut diamonds.The stones are set in pave setting. The back Is Screw Back for More Secure Fit. • Earrings Size: approx. 6mm (Square ) • Earrings Weight : approx. 1200+ Sold! NEVER FADES! Hypoallergenic Surgical Steel! Backing: Screw Backs. 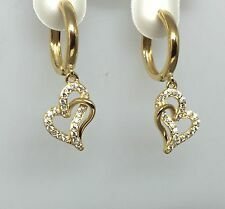 You Will Receive One Pair Of Earrings As Shown Above. AAA CZ Stones Looks Like Real Diamonds. Earring Stud Screw Back. Backing: Screw Back. •Gold Stainless Steal Cz 1 Row Cross Dangle Earrings Make For A Perfect Shine. Stainless Steal Gold. Stainless Steal. 14kt Solid White Gold 5MM 1 Carat Cubic Zirconia Stud Earrings..100% Guaranteed! Earrings include 14kt. CUBIC ZIRCONIA. STUD EARRINGS. EQUAL TO 1/2 CARAT EACH EAR.1 CARAT TOTAL! Solid White Gold backs! WHITE GOLD. looking for a good item at a good price. 4.5 out of 5 stars - 14kt Solid White Gold 5MM 1 Carat Cubic Zirconia Stud Earrings..100% Guaranteed! 3 product ratings3 product ratings - 14kt Solid White Gold 5MM 1 Carat Cubic Zirconia Stud Earrings..100% Guaranteed! High Quality 925 Sterling Silver Iced Out Lab Diamond Round Stud Earring: (A PAIR). Main Stone: Micro Pave Lab Diamond. High Polish. With 925 Stamped. Stone cut: Round. Material: 14k White Gold Finish. Earring Specifications. Backing: Screw Backs. Description: Including one gift bag Material:Stainless Steel Color:Black 30 days Money Back Guarantee Occassions:Christams, Valentine, Birthday Gift. Party, Wedding, you can wear when you like. 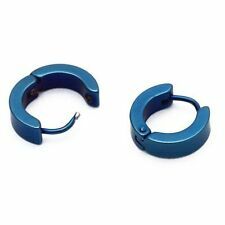 We have other colors such as blue/gold/Silver color for this earring, if you like, pls find below link: ​ https://www.ebay.com/itm/400997004697 ​ Earrings Height: 14mm Width: 4mm Quantity one pair(2pcs) . Earring Stud Screw Back. Backing: Screw Back. Brand: MENDINO Color: Black Material : 316L Stainless Steel Diameter: 4mm(W) x 14mm(H) Its special design will make you look unique. It is a good gift for your lover, family, friend and coworkers. Men's earrings and studs attach to the ear lobes through a pierced hole. Studs and earrings are typically made of hypoallergenic materials to avoid causing allergic reactions. 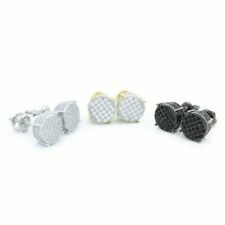 Men's earrings and studs come in a wide variety of materials and styles. What are the basic types of men's earrings? Stud: Stud earrings feature a metal post with an ornament on the top. With stud earrings, the ornament is visible on the front of the ear lobe. The stud earrings are kept in place with a friction clasp or butterfly clasp on the back. Drop: Drop earrings go through a piercing in the ear lobe and consist of a post from which a chain hangs. At the end of the earring's chain, there is an ornament. Hoop: A hoop earring consists of a circular or semi-circular piece of gold, sterling silver, or other metal coming off the end of the post and wrapping around the ear lobe. Huggie: Huggies snugly wrap around the ear lobe and are made from jewelry molds. What materials are men's earrings made from? 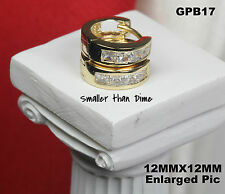 Gold: Stud, hoop, dangle, or huggie earrings may be made from 10, 14, 18, or 24 karat yellow, black, or white gold. Silver: Silver and sterling silver are less expensive than gold earrings. They can be plated with a gold-tone finish. Stainless steel: Stainless steel is used for stud earrings and hoops. It often comes with adornments such as attached rhinestones or crystals. Other metals: Rhodium and nickel may be used instead of silver, sterling silver, or gold for the posts or fasteners of stud earrings and jewelry. 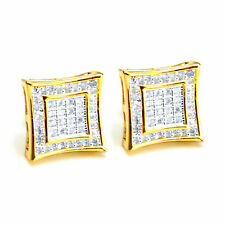 Diamonds: Diamond studs and hoops are popular for men's and women's earrings. Other natural gems: Other gems including topaz, aquamarine, emerald, ruby, opal, and pearl may be used in stud earrings and men's ear jewelry. Cubic zirconia: Cubic zirconia, or CZ, is engineered to look like a diamond. It has the same shine and same cut types as diamond but at a much lower price than a diamond. How does one choose men's earrings and studs? 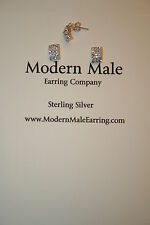 Choose a style: Studs, huggies, drop, dangle, or hoop earrings are available for men. Choose a material: Choose from black, yellow, or white gold, silver or sterling silver, other metals, diamonds, or other natural or engineered gems to adorn the studs. Choose a size: Choose small to large studs, dangles, or rings for the ears. Choose a shape: Square, round, triangular, barbell, and semi-circular are options for stud earrings and other fashion jewelry for the ears. Choose a color: Stud earrings and other jewelry for men's earrings comes in a full range of colors, including black, white, and gold for the stud posts and a rainbow of colors for the gems or rhinestones.